A soubise (sue-beez) is basically stewed onions that have been slow braised in a low oven with a bit of rice to bind it all together. At the end, a bit of cream and cheese is added. It's divine. And classic Julia Child. Is it a "side?" Is it a sauce? You decide. Here, I paired it with fresh asparagus. I've also used it on sandwiches. Paired with beef or lamb, you can't go wrong. I really encourage you to try this one. As the onions bake, something magical happens. They sweeten and take on a whole new dimension. No, it's not a gratin. It's a bit sweeter, but with a deeper nuance. The first time I made this, I used a mandolin to make really thin slices. I don't really recommend that route. As the soubise baked, the onions basically disappeared and melted away. The second time, I sliced them by hand. With a proper, sharp knife, it is quick going. The sharper the knife, the less tears you'll shed. You will need a sturdy, small pot for baking. I don't recommend a baking dish. You want some depth for this dish. I used an 8-inch, cast iron, enameled Dutch oven. Unlike Julia's recipe, I added one tablespoon of fresh minced thyme to the onions. Once, I subbed a good Parmesan for the required Gruyere. Both work equally well, but the latter will give a bit more gooey nuttiness. You may wish to mix in some chopped parsley at the end for a bit of color. This keeps well for several days in the fridge. Pre-heat oven to 300 F. degrees. Bring a small pot of salted water to the boil. Melt butter in a large pan over medium heat and begin adding sliced onions and thyme. Cook just until they begin to go soft and are well-coated with the butter. Sprinkle with salt and pepper to taste. Remove from heat. Add rice to the salted, boiling water and cook for just five minutes or so. Drain into a sieve. Add the drained rice to the onion mixture and stir. Pour mixture into a small Dutch oven or something similar. Cover tightly and bake for one hour, stirring once or twice during the process. Remove from oven and add the lesser amounts of cheese and cream, adding more if you think it's needed. If desired, stir in a bit of chopped parsley. This makes about four cups. Even here in the South, it's been a long cold winter. So when the spell finally broke the other day and temperatures hit the 80-degree mark, my appetite suddenly changed. I wanted to eat spring. 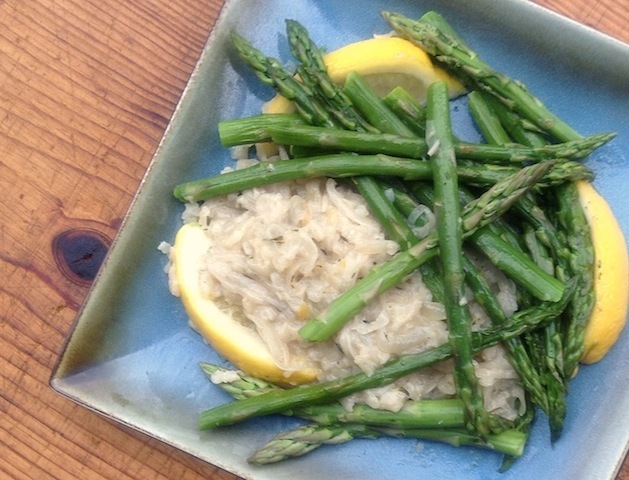 Green, plump stalks of fresh asparagus are now heralding the markets. In this simple pasta dish, it takes center stage with earthy mushrooms, sweet grape tomatoes and lots of garlic. Nothing complicated. 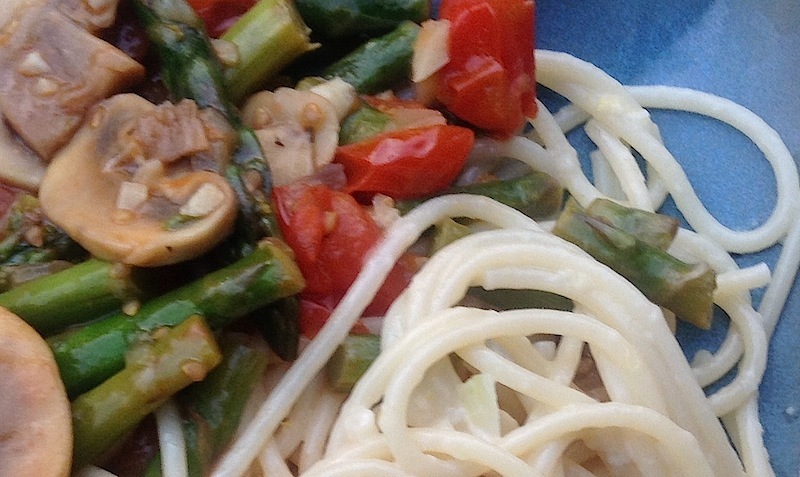 A simple but satisfying dish, as welcome as spring. Feel free to adjust the garlic quantities to taste. Here, I used plain button mushrooms for their plump earthiness. 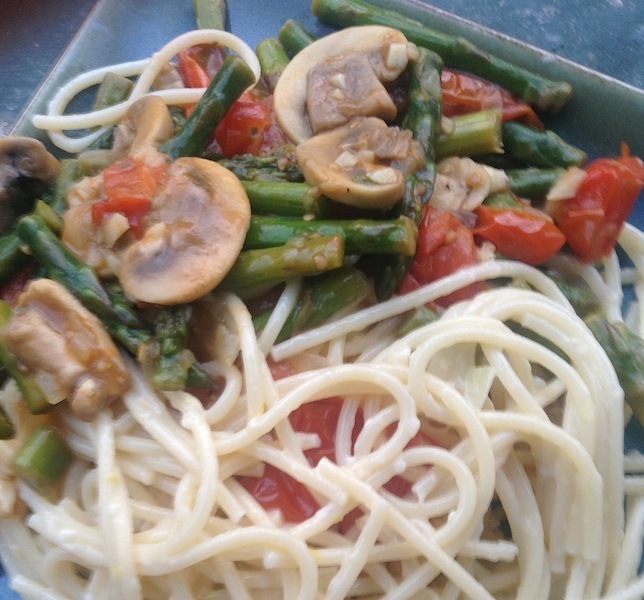 Since this is meatless, use mushrooms that have some "tooth" in them. Bring a pot of salted water to the boil. 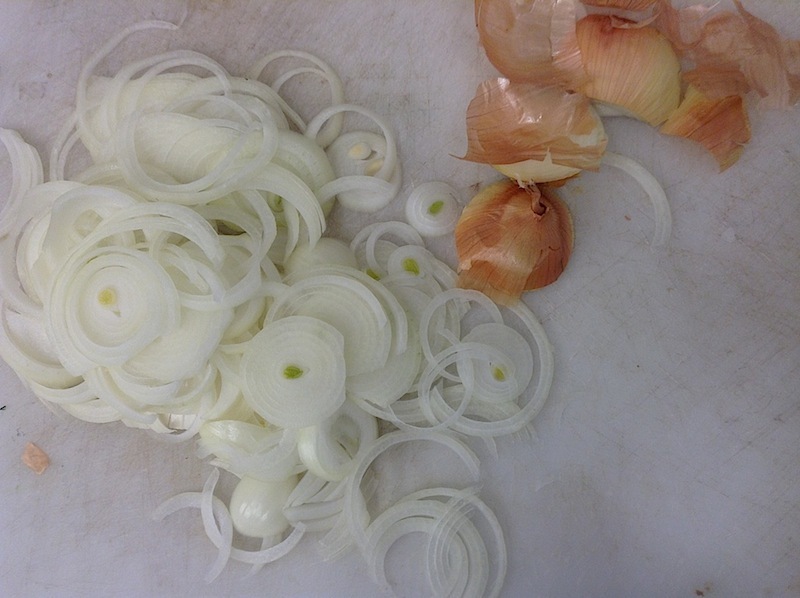 Add a few slices from one of the reserved, two garlic cloves to add some added flavor to the pasta. Add spaghetti and cook until done. In a medium pan, melt a nob of butter along with some olive oil. Add the chopped onion. 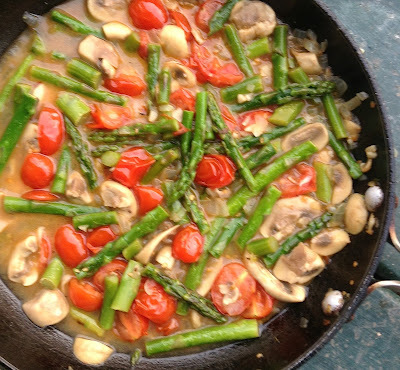 Cook for several minutes then add the asparagus and mushrooms. Cook several minutes more. Add a bit of chicken stock and the chopped garlic. Last, add the tomatoes and allow the mixture to simmer a bit. If you have it, add a shake or two of fish sauce. If the mixture appears too dry, add a bit more stock and, if you want it a bit thicker, a teaspoon or two of corn starch mixed with some of the stock. Keep the vegetables on the large side when cutting. Drain spaghetti. Add a good drizzle of olive oil and a few tablespoons of butter. Salt and pepper to taste. Using a micro plane, zest in some fresh garlic and lemon zest. Toss. Taste and re-season if necessary. Mix in cheese. Serve pasta on the side of a plate with vegetable mixture overlapping a bit. Drizzle with the sauce.